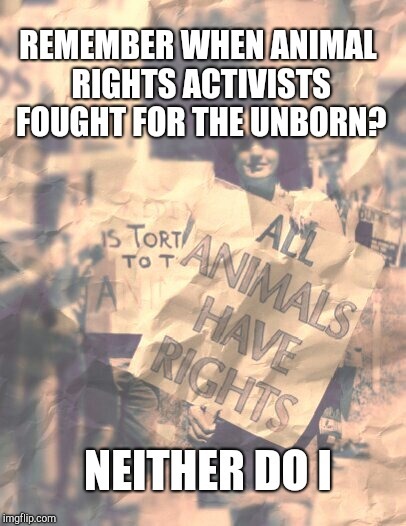 Funny you should mention that.Most animal rights activists think ALL creatures matter,not just unborn humans.And yes,we liberal animal activists & environmentalists DO fight for the unborn every time we fight against pollution in the environment that causes birth defects & childhood cancers.We fight for compassion in the world as well,because a world in which animals are tortured is one in which people are tortured. It all springs from the same roots ; a lack of empathy. Why do I never see birthers standing outside women's clinics with checkbook in hand? Why don't you open your home to homeless pregnant women like my prochoice Mom has? As long as birthers support politicians who cut aid to women & children,cutting out prenatal care,infant nutrition programs,Medicaid,food stamps,housing benefits,educational funding,& even HEALTH DEPARTMENT SERVICES,& putting that money into making bombs,paying oil subsidies(CORPORATE WELFARE! ),& stuffing the pockets of rich corporate executives & greedy politicians Right To Lifers cannot claim to support life! Not when you support politicians who bring only suffering, war & hardship on the unborn you claim to "protect "from the very first breath those babies draw upon leaving their Mamas womb!